BLUEBERRY MINT SPRITZER is a thirst quenching summer time beverage made with 4 simple ingredients and ready in 5 minutes. This recipe is one the entire family will love! I love making special drinks when we have guests over, especially during the spring and summer. They can add so much color to the table, acting like a little delectable decoration. My favorite drink to make is my Strawberry Mint Spritzer and that recipe is exactly what inspired this drink. And I am completely in love. after a few tries we got it. What I love about this drink is the beautiful purple color. 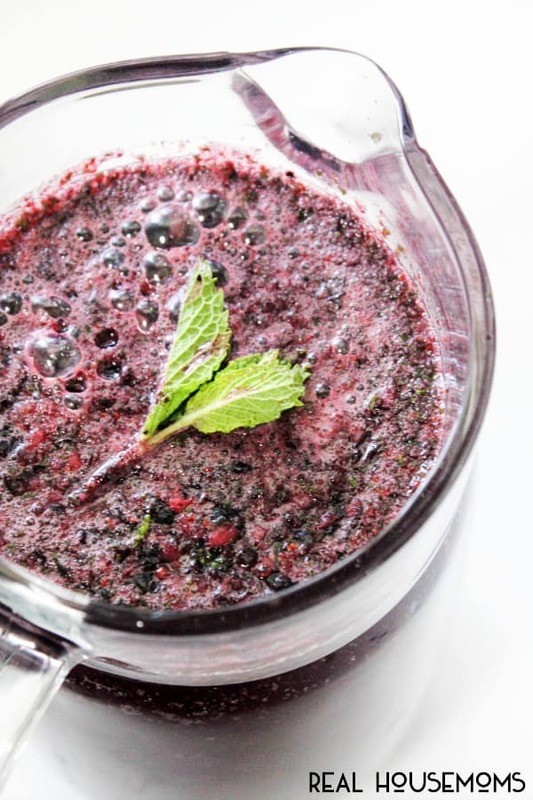 When you first add the blueberries and mint, you see the color of the spritzer slowly start to change and that is just gorgeous. I would serve it that was to the table, then stir it right before you pour. Trust me you will get some ooo’s and awe’s. Looking for something with a little more “beach” feel try my Tropical Italian Cream Soda, this is my kid’s more requested drink. Having a few friends over for lunch or hosting a brunch or just a family dinner, this Blueberry Mint Spritzer is just the drink that you need to serve. Enjoy friends. 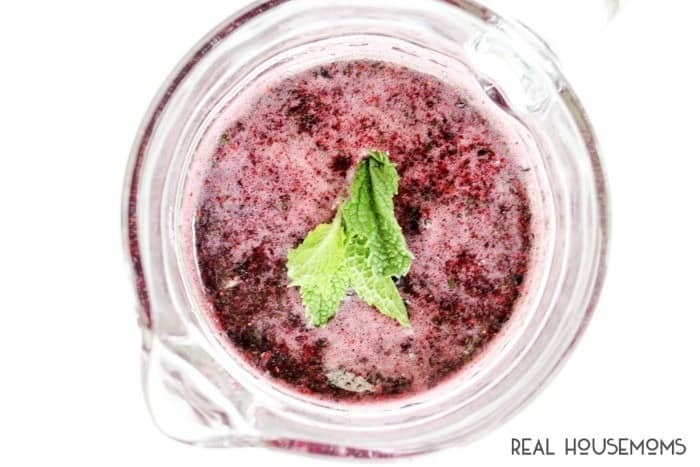 Blueberry Mint Spritzer a fresh, fruit & thirst quenching non-alcoholic beverage that is made with 4 simple ingredients and ready in 5 minutes. 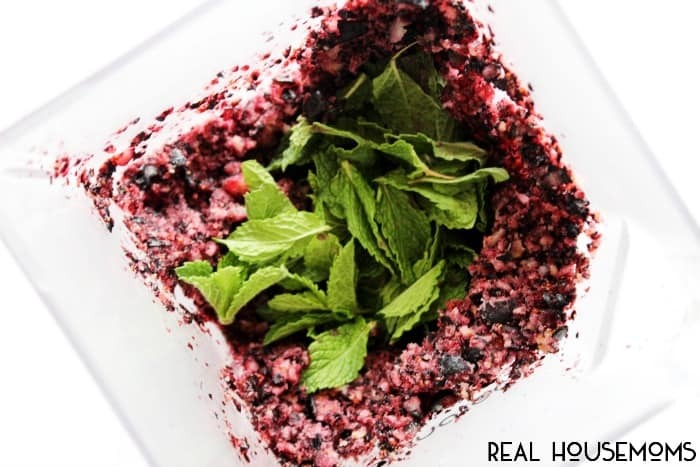 Place the blueberries in a blender or food processor and turn on to chop up the blueberries into small, small pieces, some of the blueberries may even become pureed. In a large pitcher stir together soda and lemonade concentrate. 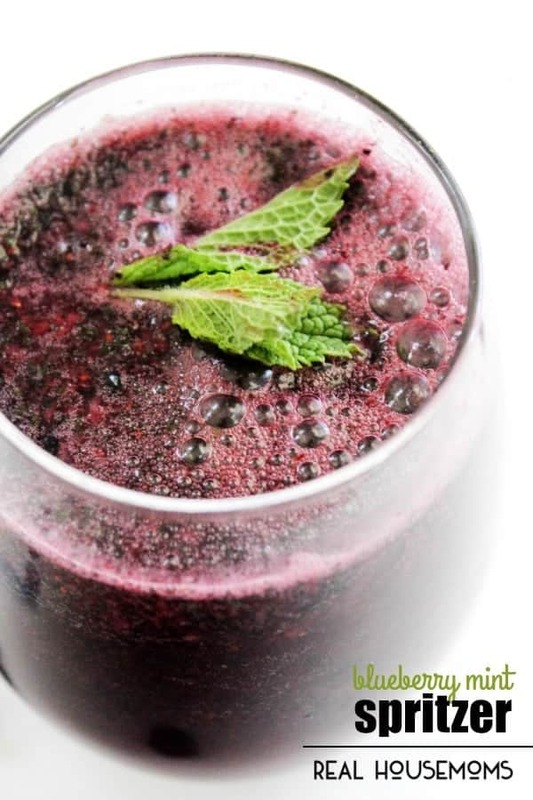 Add one cup of soda and lemonade mixer to the blender, along with 1/3 cup mint leaves. Puree the mixture together for 3-5 seconds, so that the mint is incorporated with the blueberries. Spoon the pureed blueberries and mint on to the top of the soda and lemonade mixture. Once all of the blueberries are added gently stir together. Be careful the spritzer will bubble and you don't want it over flowing your pitcher. If you don't have a large pitcher just divide among two smaller pitchers. At this point you can serve as is, which is what I prefer because I love the little blueberry pieces. But my kids prefer me to strain the blueberries out. Choose what you prefer. Pour into individual glasses and garnish with mint leaves or lemon slices if desired. I love roughing it in the Rockies with family and friends and guiding backpacking trips. With my entire family just minutes away, I love cooking for the whole clan, whipping up a weekday family dinner, or delivering a meal to someone in need. I simply want people to feel my love through my food.